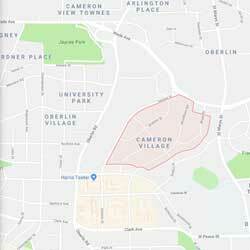 Cameron Village is located in Raleigh, NC. It was a master planned community that was first established in the 1940s by JW York and BA Bryon. Their plan was to develop a “village” consisting of single family homes, apartments and an open-air shopping center. Residences in Cameron Village are set back from streets and have deep front lawns. Driveways, carports, and garages are common and there are few sidewalks. Today the Cameron Village historic district is the first “mixed-use and first curvilinear subdivision” in North Carolina. It is also an excellent collection of well-designed ranch homes and clustered modern apartment buildings. Square footage ranges from 1,500-2,500sq ft.
Not only is this area great for shopping but it is also a great place for your business. Cameron Village is home to over 100 professional offices.